Kids now-a-days have so many toys that most parents, including us, have a difficult time finding ample storage and managing the inevitable clutter. The best possible entertainment, I find, are activities that we make ourselves and not ones that are specifically for the kids anyway. We involve the girls in our everyday life encouraging and expecting that they participate in our family life. 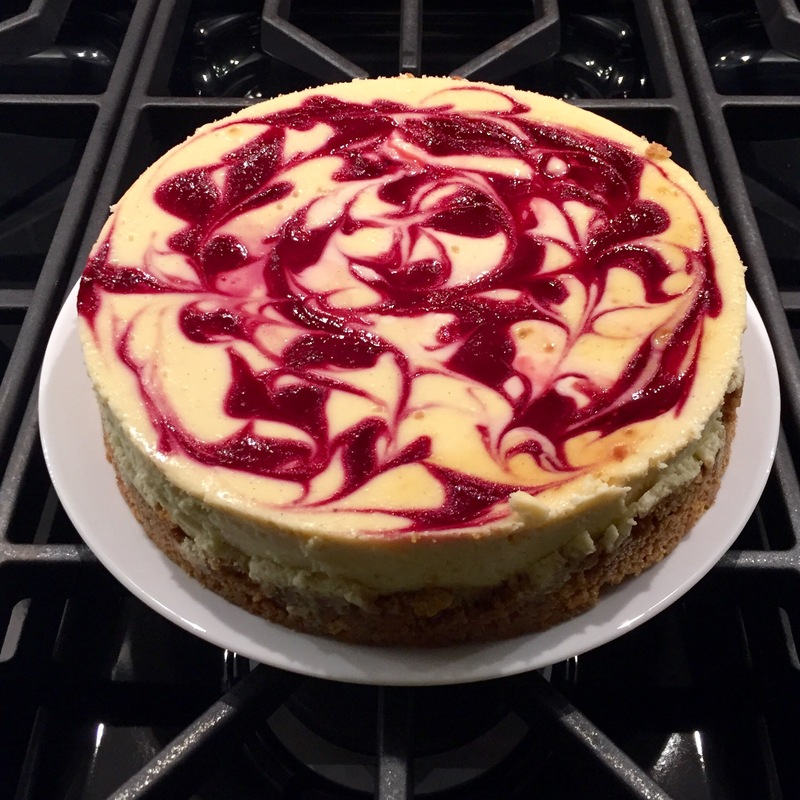 One such example was the making of a Vanilla Bean Raspberry Swirl cheesecake which both Sophia and Eliza helped me make. Eliza helped weigh out the graham crackers and Sophia crushed them and mixed the melted butter into the crumb mixture. 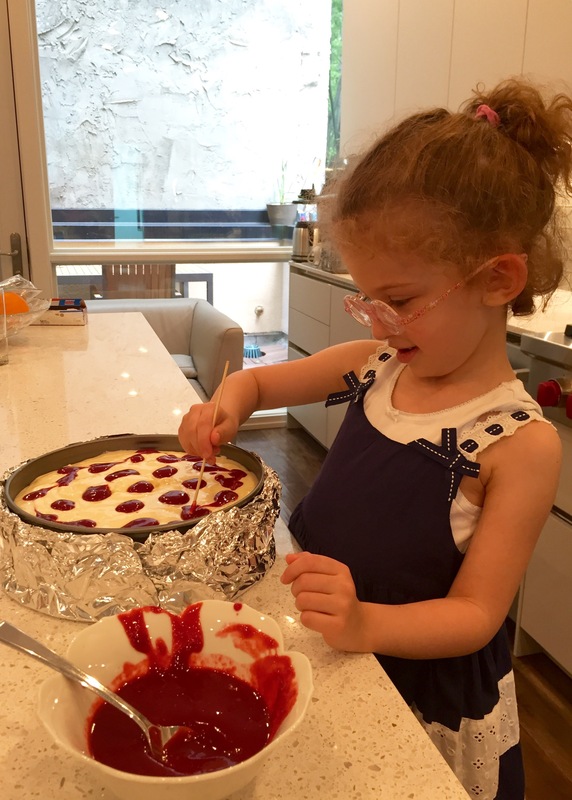 Sophia also helped swirl the unbelievably good raspberry sauce before we put the cake into the oven. She loved being so creative with the swirling. The cheesecake turned out out of this world and a recipe is forthcoming. Speaking of homemade or handmade or made at home and by hand is this beautiful quilt. My sister Anna has taken two years to make it and it was worth the wait. It is so special because it is made especially for Eliza. The design is bright and airy—it isn’t too girly because of its geometrical pattern structure but hints of femininity with its bright pinks and reds. 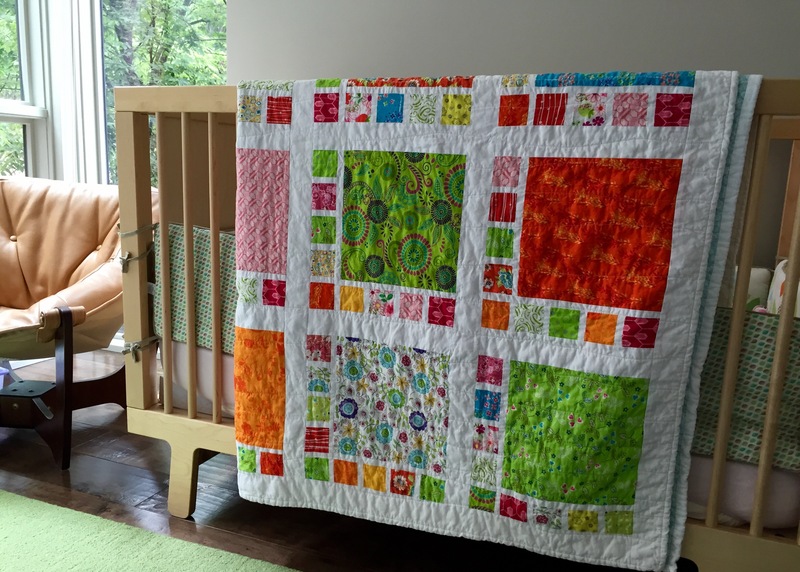 Without trying, the quilt has brought the rest of the elements in her small nursery together. Eliza loves to cover herself with ” ‘da blaket ‘dat Anya made!” This weekend was mostly about spending time as a family. 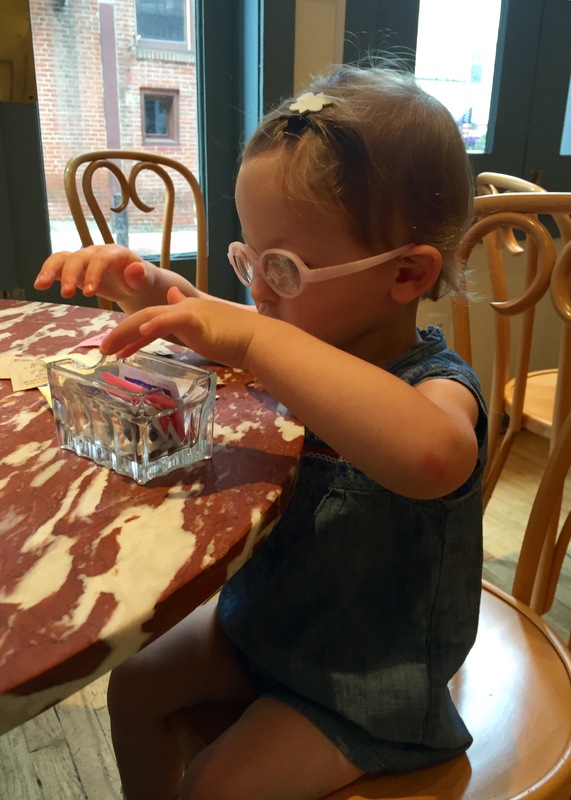 We followed what has become a bit of a routine—a visit to a coffee shop, a trip to the farmer’s market, a dance class, and lots and lots of time outside. Evan and I did manage to have an evening out. A friend of ours from college was getting married and we were excited to share the day with him and his beautiful bride. 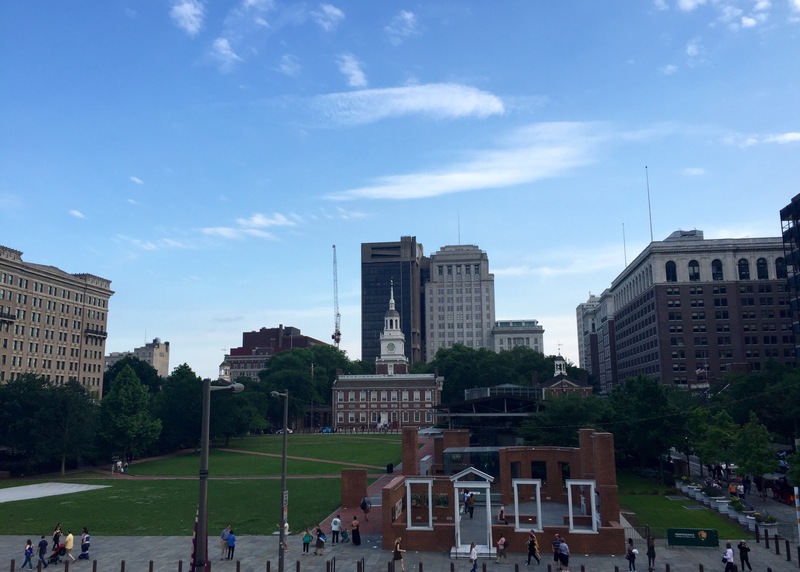 The wedding was held outdoors overlooking Independence Hall and the beautiful park grounds of Old City. I never tire of this view and never take it for granted. 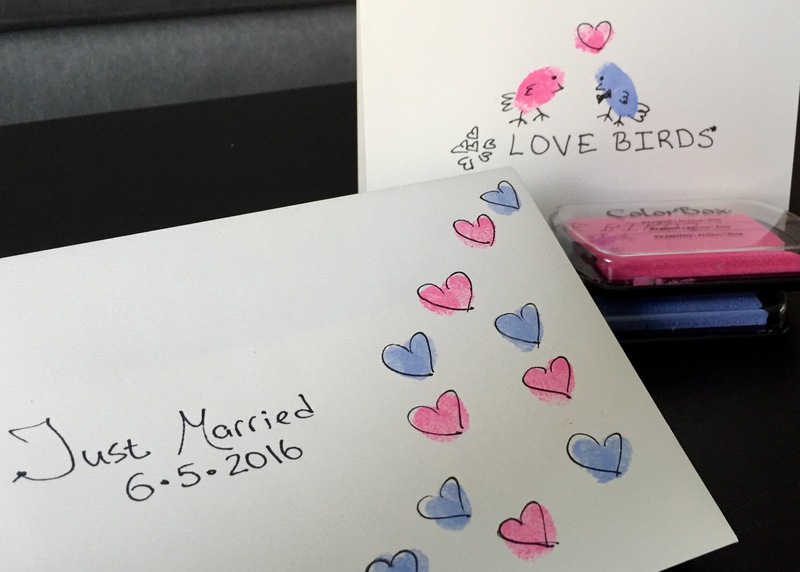 Sophia and Eliza helped make a wedding card and we think it turned out rather cute.